Swami Premanand Mahavidyalaya, Hoshiarpur has advertised in Tribune newspaper for the recruitment of Assistant Professor jobs vacancies. Interested and eligible job aspirants are requested to apply within 21 days from 20th June 2018. Check out further more details below. Qualification: Only NET / SET qualified or Ph.D candidates are required to apply. 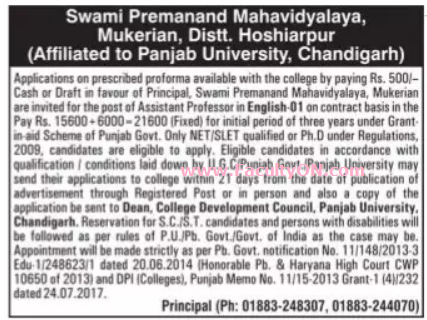 Reference: TRIBUNE newspaper dated 20th June 2018 advt by Swami Premanand Mahavidyalaya, Hoshiarpur for Assistant Professor Jobs in English.